2 Cheap Cars Super City Rangers (NBL) inked 25-year old Australian forward Venkatesha Jois (203-104kg-93, college: EWU). He played recently at United in Australian NBL league. But in 11 games he averaged just 1.7ppg this season. Jois helped them to make it to the final after they ended regular season as second best team. 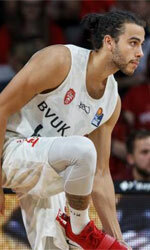 He also played for SC Rasta Vechta (BBL) in German league where in 8 NBL games he had 5.9ppg, 4.6rpg and 1.0spg. Jois received CoSIDA NCAA Division I Academic All-District 8 1st Team award back in 2016 at his college time. Jois is a very experienced player. He has quite traveled the world as his pro career brought him to four different countries on three different continents (Europe, Asia and of course North America). Jois has played previously professionally in Croatia (KK Vrijednosnice Osijek), Estonia, Japan (Shiga L-Stars) and Latvia (Tartu Ulikool).